Back to the future at Ravenglass! 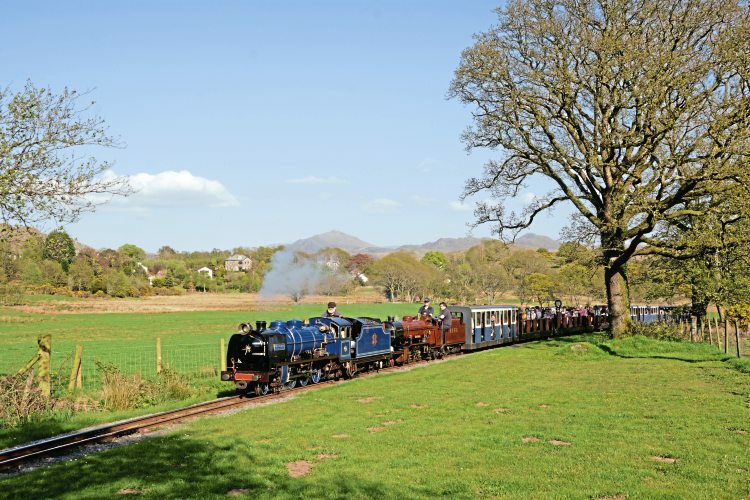 The original Ravenglass and Eskdale Railway was a seven-mile 3ft gauge line opened in May 1875 to transport hematite iron ore from mines around Boot to the Furness Railway standard gauge line at Ravenglass. Passengers were carried until November 1908, making it the first public narrow gauge railway in England, but the line closed in April 1913. Between 1915 and 1917, the line was converted to 15in gauge with services operated initially by Bassett-Lowke-built, 4-4-2 Sans Pareil. An assortment of other larger locomotives followed. The ‘Train from Spain’; the Krauss-built Pacific imported from Barcelona in 2017, now carrying its Whillan Beck nameplates, pilots River Mite into Irton Road on May 6. The line struggled on until 1960 when it was sold at auction. Local people and railway enthusiasts had formed the Ravenglass and Eskdale Railway Preservation Society to save the line, with financial backing by Sir Wavell Wakefield, MP for Marylebone and owner of the Ullswater Steamers. The railway was owned and operated by a private company, with the backing of the preservation society, an arrangement that is still in place. Since preservation the line has gone from strength to strength and further engines were required; with 2-8-2 River Mite entering service in 1967, followed by 2-6-2 Northern Rock, constructed by the company itself. Diesel locomotives have also been constructed. Read more and view more images in Issue 242 of HR – on sale now!